According to information from German public TV and radio station WDR, eviction of #HambachForest treehouses has been ordered by NRW construction minister starting this morning of Thurs 13th september. At 16:00 (04:00pm) there will be a demo that starts at Buir train station (Bahnhof). Apparently for safety of occupiers because of fire danger. They say it’ll be one of biggest&longest police operations in history of NRW. In case any forest dwellers still want to give their identity and challenge the eviction through the legal system, please write us by e-mail, we can then send you a draft, that you can fill in and send to the Verwaltungsgericht (administrative court) Cologne. Follow @HambiBleibt and hashtags #HambiBleibt or #HambacherForst on Twitter for updates! Tensions are rising in and around the 12,000 year old Hambach forest. This morning (Wednesday 12th of September, at around 10:30) a police-officer fired a warning-shot in response to an attack by masked militants allegedly throwing rocks at police-officers and -cars, on the L276, a.k.a. the Secu-Road. The current situation in the Rheinish lignite-mining area, with the strong police presence, the forced isolation, the continuous controls, and the constant threat of eviction of the climate-justice occupation, is putting a large amount of psychological pressure on activists, as well as to some extent police officers in the area. Therefore we are asking for a general de-escalation of the situation in and around the Hambach Forest, in order to give activists, as well as state-workers, a much needed break. For this the first step would be the removal of the limited state-of-emergency, or the so-called “danger-zone”, and secondly a clear message from energy-giant RWE that the climate-justice occupation camp will not be the target of an eviction or any other police action. The removal of the state of “danger-zone”, and the ending of the deployment of several hundred police-officers, would also free up large amounts of resources in the state of NRW, which could then be directed towards the much more pressing topic of a transition towards green energy. 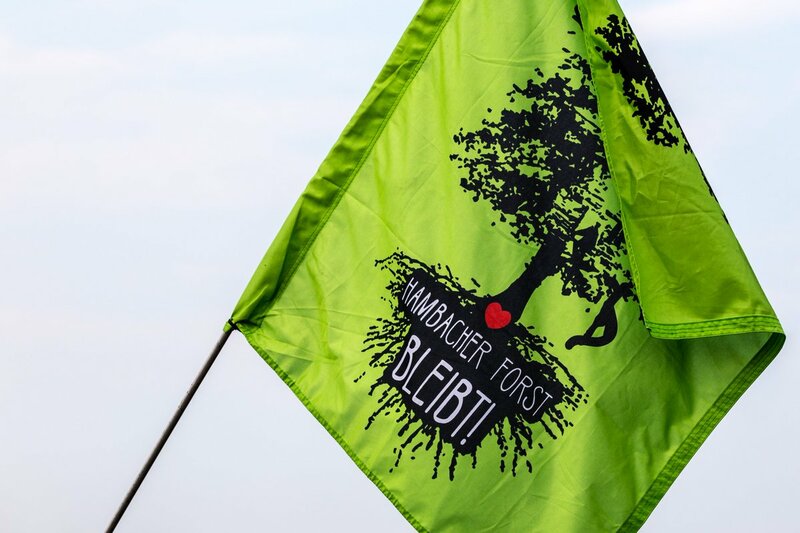 To resist the probable begin of treehouse evictions, and the coming plans for cutting, there will be a demonstration walking from Buir to Hambach Forest starting at 4pm until 6.30pm. Take care:at all stations between dortmund and duisburg there are police watching out who is moving in direction monchengladbach or aachen. Take care of yourselves! Previous post: Announcing the 2018 #Seattle Anarchist Bookfair!